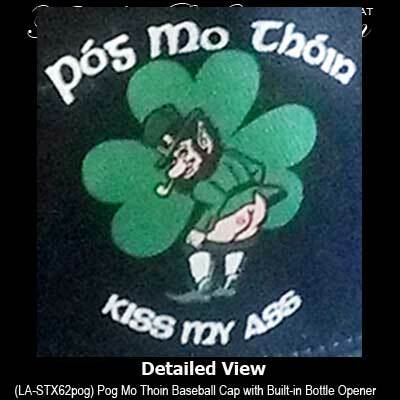 The words Póg Mo Thóin, that are featured on this Irish cap, are Gaelic for Kiss My Arse. 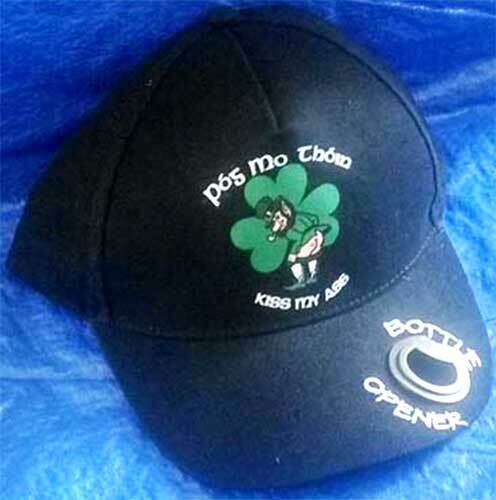 This Irish cap features the words Póg Mo Thóin along with a suggestive leprechaun and a shamrock too. The 100% cotton Irish baseball cap also has a built-in metal bottle opener in the brim. This black Irish hat with an adjustable Velcro strap is one size fits most and features both embroidered and printed designs. The Póg Mo Thóin cap is made in Ireland by Liffey Artefacts and it includes a shamrock history card, complements of The Irish Gift House.